Eversource Energy (NYSE: ES) today confirmed that it has submitted a revised proposal to acquire Connecticut Water Service, Inc. (Nasdaq: CTWS), which it believes provides a superior alternative to the previously agreed takeover of Connecticut Water by SJW Group (NYSE: SJW) (“San Jose Water”). Eversource Confirms Full Terms of Revised Superior Proposal to Connecticut Water (Graphic: Business Wire). Under the terms of Eversource’s superior proposal, Eversource would acquire all of the outstanding shares of Connecticut Water common stock for $64.00 per share in cash and/or in Eversource common stock at the election of Connecticut Water shareholders. 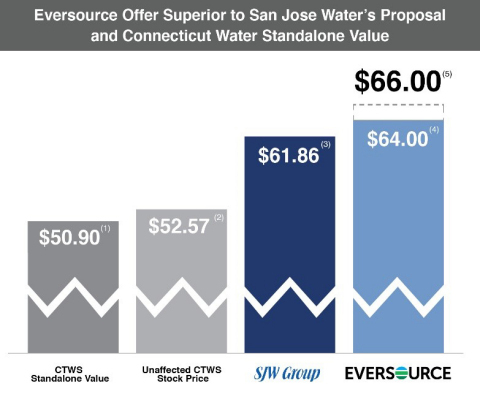 If the proposed transaction with San Jose Water is terminated with no break fees payable by Connecticut Water, Eversource would increase its offer to $66.00 per share of Connecticut Water. In either scenario, Eversource’s proposal far exceeds the $61.86 per share offered by San Jose Water as well as the midpoint of the Connecticut Water standalone discounted cash flow of $50.90 per share that Connecticut Water’s own financial advisors disclosed as part of its fairness opinion analysis. Additionally, Connecticut Water shareholders electing to receive Eversource stock would receive 76% dividend accretion6 compared to 2% dividend accretion in a transaction with San Jose Water. (1) Midpoint of Connecticut Water’s financial advisor’s discounted cash flow range of $40.42-$61.38 per Connecticut Water share, as disclosed in its fairness opinion analysis summarized in SEC reports; (2) Connecticut Water’s undisturbed share price, as of March 14, 2018; (3) Implied value of San Jose Water’s offer per Connecticut Water share as of March 14, 2018, the day before announcement, calculated using San Jose Water’s undisturbed share price as of March 14, 2018 of $54.38 multiplied by the exchange ratio of 1.1375x; (4) Eversource’s superior proposal, submitted on July 2, 2018; (5) If the proposed transaction with San Jose Water is terminated with no break fees payable by Connecticut Water, Eversource would increase its offer to $66.00 per share of Connecticut Water. (6) The 76% dividend uplift is based on the $64.00 per share base offer, the closing price of Eversource’s common stock on July 10, 2018, and the annualized quarterly cash dividend of $0.3125 per share declared by Connecticut Water on May 10, 2018. As a tangible sign of Eversource’s commitment to a quick and efficient transaction close, Eversource has also proposed an incremental “ticking fee” should Eversource not achieve all required regulatory approvals within eight months of deal announcement. This “ticking fee” would result in a $0.50 per share increase to the offer price paid to Connecticut Water shareholders for each subsequent calendar quarter required to receive regulatory approvals following the eight-month deadline. This stands in stark contrast to San Jose Water’s inferior proposal, which would require an extensive regulatory review process in San Jose Water’s home state of California as well as in Connecticut and Maine, where San Jose Water has no operations. Despite Connecticut Water’s claims to the contrary, Eversource’s revised superior proposal includes extensive and specific commitments to customers, communities and employees. These include: a base rate freeze for customers through 2022; the doubling of Connecticut Water’s charitable contributions to the communities it serves; and the retention of key executives and employees. Eversource submitted its revised superior proposal confidentially on July 2, 2018 in hopes of engaging productively following an initial meeting Eversource requested on June 29, 2018 between Eversource Chairman and Chief Executive James Judge and Connecticut Water Chairman Carol Wallace and Chief Executive David Benoit. Contrary to its claims in its July 13, 2018 press release, Connecticut Water’s board provided no operating or financial information during or subsequent to this meeting. Connecticut Water’s board then rejected Eversource’s superior proposal and refused to engage unless Eversource increased its offer to at least $69.50 per share. Eversource believes this is an unrealistic position that is wholly inconsistent with Connecticut Water’s own previously disclosed financial analysis as well as current market trading dynamics. Eversource believes that the fact that Connecticut Water’s board is making this $69.50 per share ultimatum while seeking shareholder approval for a transaction that it has valued at $61.86 once again demonstrates that the board has shown no interest in carrying out its fiduciary duties to pursue the best value available for its shareholders and other constituencies. Eversource has publicly confirmed the full terms of its improved superior proposal so that Connecticut Water shareholders are not misled by their board into accepting an inferior transaction with San Jose Water. Eversource looks forward to making its case directly to Connecticut Water shareholders and regulators and will continue to urge Connecticut Water shareholders to vote “AGAINST” the inferior San Jose Water proposal by completing the BLUE proxy card once Eversource publicly files its definitive proxy materials. Thank you and Carol for the meeting on June 29. It was nice to meet you both. I very much appreciated the opportunity to discuss our interest in Connecticut Water, discuss the great potential for the combined company, and discuss what we believe to be a superior proposal compared to your proposed transaction with SJW Group. As mentioned at our meeting, I am submitting in writing a revised proposal to acquire Connecticut Water under terms we believe are in the best interest of the customers, employees, suppliers, local communities and shareholders of Connecticut Water due to the greater benefits achievable through an Eversource transaction. We think that both the terms of our improved superior proposal and the environment in which you evaluate our improved proposal are very important considerations. Eversource proposes to acquire all the outstanding shares of Connecticut Water common stock for $64.00 per share in cash and/or in Eversource common stock at the election of Connecticut Water shareholders. If your proposed transaction with SJW is terminated with no break fees payable by you, we would increase our offer to $66.00 per Connecticut Water share. Additionally, as a tangible sign of our commitment to a quick and efficient transaction close, we would be willing to offer an incremental “ticking fee” should Eversource not achieve all required regulatory approvals within eight months of deal announcement. This “ticking fee” would result in a $0.50 per share increase to the offer price paid to Connecticut Water shareholders for each subsequent calendar quarter required to close the transaction following the eight-month deadline. Connecticut Water shareholders electing to receive Eversource stock as consideration would realize the equivalent of a 77% dividend uplift based on the $64.00 per share base offer, the closing price of Eversource’s common stock on June 29, 2018, and the annualized quarterly cash dividend of $0.3125 per share declared by Connecticut Water on May 10, 2018. These substantial improvements are intended to convey a very clear message that we respect and value the Connecticut Water Platform and we believe that this transaction is materially better for all constituents than the contemplated transaction with SJW. In addition, we believe this improved offer represents a superior alternative to Connecticut Water’s standalone proposition. Eversource has a market capitalization of approximately $19 billion and is an A+ rated company by Standard & Poor’s, making Eversource a strong financial partner for the transaction. There would be no financing contingency as part of the transaction. Eversource has consistently demonstrated credibility, expertise, and responsiveness in its proceedings before the Connecticut Public Utilities Regulatory Authority and other regulatory bodies and has a strong track record for successful regulatory outcomes. In particular, Eversource has considerable experience in obtaining regulatory approvals required for utility mergers and acquisitions. This is evidenced through our recent acquisition of Aquarion Water Company, for which we obtained regulatory approvals in four states (including Connecticut and Maine) and completed the transaction within five months from the regulatory filing date and within six months from the announcement of the transaction. Additionally, Eversource is uniquely positioned to create substantial benefits for customers served by Connecticut Water, while preserving local ownership and accountability. In summation, Eversource’s combination with Connecticut Water would be a compelling, superior alternative to the SJW transaction for Connecticut Water’s customers, employees, suppliers, communities and shareholders. An Eversource transaction would also leverage the geographical proximity of the Connecticut Water and Aquarion systems to enable cost-effective infrastructure investment and support regional economic growth. I have reviewed this opportunity with Eversource Board members who support the submission of this proposal. For the time being, we are planning to keep this proposal confidential to allow the Connecticut Water Board and its advisors ample time to analyze and engage with us constructively. We would appreciate your response by July 9, 2018. We are prepared to engage with you immediately and to reach a definitive agreement as expeditiously as possible. For the avoidance of doubt, this proposal is a non-binding indication of interest, subject to confirmatory due diligence, which we believe can be completed expeditiously and within two weeks of receiving access to your data room. A binding obligation with respect to this transaction will result only from the execution of a definitive agreement containing terms and conditions that are mutually acceptable to the parties. Thank you and Carol for the call and subsequent letter on July 7. We appreciate your swift response to our improved proposal that included a price increase to $64.00 and substantial customer, charitable and other commitments. We were very disappointed with your unwillingness to substantially engage and surprised by your ask, and the lack of rationale for our bid having to exceed $69.50 per share for you to engage in discussions. We firmly believe that our revised proposal to acquire all of the outstanding shares of Connecticut Water common stock for $64.00 per share in cash and/or in Eversource common stock, along with the 76% dividend uplift and the extensive and specific customer, employee, and charitable benefits, is superior compared to your proposed sale to San Jose Water that has questionable benefits for all constituents. We continue to struggle to envision the synergies required to justify your valuation ask that would be derived from combining two utilities on opposite sides of the country. The trading prices currently in the market certainly imply the expectation that your transaction with San Jose Water will not close. Additionally, we believe our revised offer of $64.00 per share is also clearly superior to your standalone valuation. As disclosed in your SEC filings, your own advisor Wells Fargo valued Connecticut Water at a midpoint discounted cash flow of $50.90 per share. Our offer represents a 26% premium to your own advisor’s midpoint DCF valuation and represents an extremely compelling 27.5x multiple to Connecticut Water’s estimated 2018 earnings per share, which is at the high end of recent utility transactions. We are confident that your shareholders will also find our offer compelling. Furthermore, we have included a meaningful ticking fee if our transaction takes longer than 8 months to get regulatory approval and we have stated that should you and San Jose Water mutually terminate your agreement and eliminate any termination fees to be paid, we would increase our offer to $66.00 per share, delivering further value to your shareholders. We strongly prefer to negotiate privately and encourage you to reconsider what we think is an unreasonable ask of at least $69.50 per share to engage. In your recent letter to us, you set a deadline of July 12 for our response. We’d ask that you please respond by close of business on that date if there is a more reasonable position to discuss. Eversource and certain of its trustees, executive officers and employees may be deemed participants in the solicitation of proxies from Connecticut Water shareholders in connection with Connecticut Water’s Special Meeting of Shareholders. Information about the interests in Connecticut Water of Eversource and such trustees, executive officers and employees is set forth in a preliminary proxy statement that was filed with the SEC on June 14, 2018 (the “Eversource Proxy”).